EURUSD has been moving with bearish bias due to the USD empowerment. Now traders are waiting for the Unemployment Rate in Europe and ISM Manufacturing PMI in the US. 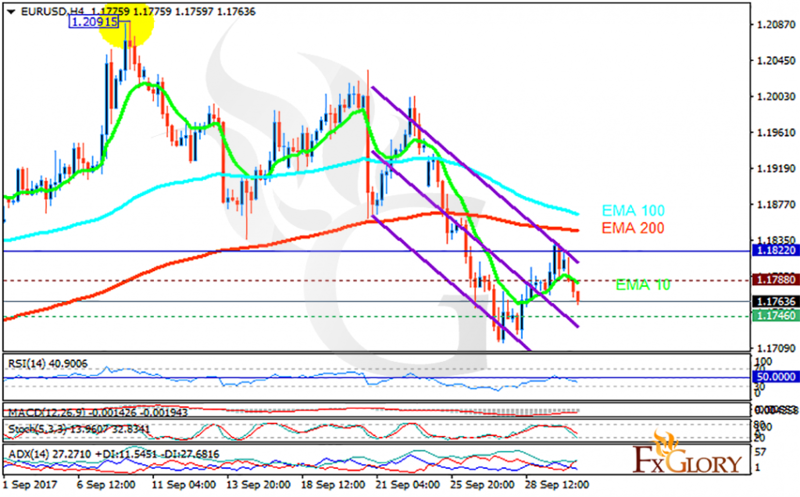 The support rests at 1.17460 with resistance at 1.17880 which both lines are below the weekly pivot point at 1.18220. The EMA of 10 is moving with bearish bias along the descendant channel and it is below the EMA of 200 and the EMA of 100. The RSI is falling towards the oversold area, the Stochastic is showing downward momentum and the MACD indicator is in negative territory. The ADX is not showing any clear signals. Sellers can target 1.70 area.